Paul’s Construction and Awnings has always had a reputation for excellence in all construction jobs they take on. To go along with that excellence, the company has also earned an excellent reputation for their affordable pricing strategy. Those winning characteristics have carried over to the company’s awning business where they are known for the best retractable awnings prices in Bucks County PA. That covers a lot of territory and encompasses dozens of townships in Bucks County. If you live in any of the preceding communities, you can take advantage this fall of the best retractable awnings price Bucks County has ever seen. Paul Construction and Sunesta Awnings put together a plan that provides local residents with the best prices ever on the exciting Sunesta Awning line. The Sunesta Awning line, in particular, is a perfect fit with the custom decks and patios Paul is known for. As a special offer to both his new and existing customers and to introduce more people to Sunsetter, he is reaching out to every homeowner in the county and extending to everyone, the absolute best retractable awnings prices in the state. Just how far does Paul’s promise to extend his offer go? Besides the Buck County Townships, special prices are also being extended to every borough in the county, beginning with the county seat of Doylestown, all the way through Bristol, Chalfont, Dublin, Hulmeville, Ivyland, Langhorne, Langhorne Manor, Morrisville and New Britain, New Hope, Newtown, Penndel, Perkasie, Quakertown, Richlandtown, Riegelsville,Sellersville, Silverdale, Telford (Montgomery County)Trumbauersville, Tullytown, Yardley- Paul has the county covered. No matter how you look at it, this is a very big deal. You can’t afford to miss out on it. 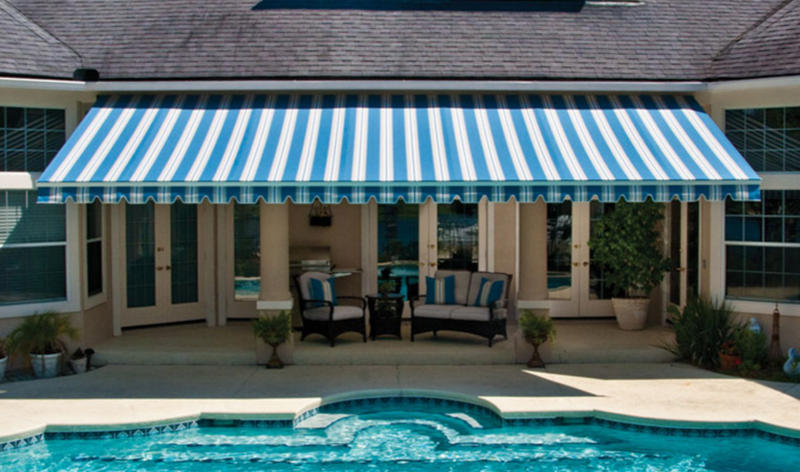 To anyone who is not familiar with Sunesta Awnings, there are a few things you should know. With a properly designed awning system, you now have the ability to make the most of your outdoor spaces by easily controlling the amount of sun you are exposed to. When the sun is at it’s brightest, your Sunesta awning can be extended to protect you from the harsh direct sunlight and make your patio a comfortable relaxing space for everyone to enjoy. For a lot less than adding a permanent room to your home, you can gain the extra space for the whole family to enjoy. When the sun has run its course, the push of a button can open up your vista and give you a whole new perspective. This is a great time to take advantage of the best retractable awnings prices in Bucks County PA. Spend some time on our website and look over Sunesta’s three top selling awning options. Need something a bit smaller? Sunstyle is perfect for medium sized patios or decks (narrow widths and large projections). The Sunlight retractable awning is perfect for those smaller decks or porches. A 10-year warranty is standard for this awning with a maximum projection of 10 ft. and PVC-protected arm cables and protective hardware covers. You can be certain that when Paul Construction and Awning install your new awnings, the job will be done the right way by professional installers. Unlike some awning companies, we make it as easy as possible for our customers. We will guide you every step of the way so that the awnings become part of your home and blend in the way they should. You will end up with beautiful functional awnings that will improve the looks and character of your home and increase its curb appeal.Take advantage of the Best Retractable Awnings Prices Bucks County PA has ever seen. Fill out the contact form on the website or call or visit Paul today.